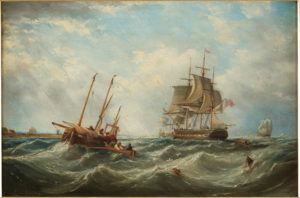 Born of 9th of June in 1800, James Wilson Carmichael was a painter based in England fueled by marine family background. His work in the form of paintings and books hence revolved around the water bodies and kept the naval within him forever alive. James Carmichael was the son of William Carmichael who was a shipbuilder in Newcastle upon Tyne, Northumberland and was born at in Ouseburn in the same city. Because of the connections of his father with the ships and marine, he has spent most of the childhood his years at the shores of the water bodies. The knowledge and skills of his about ships and shores earned him opportunities to sail at the different parts of Spain and Portugal for a period of three years by means of a vessel sailing. After this, he was presented with the working opportunity as an apprentice to a renowned shipbuilding firm of that time. But none of the opportunities to work in the field of ship carpentry or marine could lure him enough as much as the art was able to. Soon after completing his apprenticeship from a shipbuilding firm, he got immersed in the division of art. Painting and colours got such a strong hold over him that he eventually gave up his father’s legacy and business and decided to be a painter. As a matter of fact, the decision was fully in favour of Carmichael as see from his later years of growth as a painter. Since the field and its terms were totally new to him, he at first declared himself as a drawing teacher and small scale painter to make way for his daily needs and earnings. Sticking true to his passion and decision, he did set up a painting workshop of his own by the young age of 23 years only. The workshop was also shared by then landscape painter Thomas Richardson Senior. The first work in the field as a painter which bough Carmichael a little amount of fame was the fight or the quarrel between Chesapeake and Shannon, which gave him earnings of 13 Guineas. The painting is not just among the first but famous and historic works of Carmichael. Another famous painting which did the publicity stunt for him was the painting of The Bombardment of Algiers for the Trinity-house of Newcastle. This painting gave him earnings of 40 Guineas, which clearly tells that the golden days of Carmichael as a painter were about to begin. This was also possible because he enjoyed his work as a painter and now that he was getting paid for his quality work, it was enough motivation to continue given that he came from a shipping background. The painting that he made for the Trinity-house is still marking his presence there alongside with collaboration works of George Balmer at the Battle of Cape St. Vincent for the Heroic Exploits of Admiral Lord Collingwood. Giving new heights to his confidence to continue as a painter was another painting on a collaboration basis for the View of Newcastle and for this he was paid one hundred Guineas from the city corporation. Carmichael also got to work with a Newcastle architect known by name of John Dobson. It was after coming under his influence that Carmichael began to paint industrial pictures as well. A set of engravings, under the cover of Views of the Newcastle and Carlisle railway, was released by him in 1838. 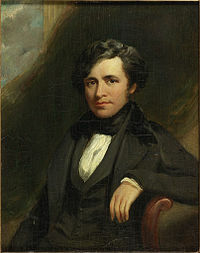 Carmichael was just 25 years old when he first appeared as an exhibitor, although for the basic motive of Promotion of Fine Arts at the Northumberland Institution in 1825. Even though his painting was not that popular yet, his work being utilized for promotional works was interpreted as a good sign of heading in the right direction by Carmichael. Later he became a renowned exhibitor through the contribution he made to the Society of British Artists. The oil painting that was exhibited at the Society exhibition was called the Shipping in the Bay of Naples. 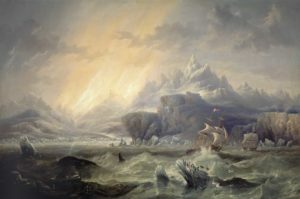 Additional to these he also exhibited at the Royal Academy and his contributions were carved out in the form of watercolour paintings and oil paintings which were The Arrival of the Royal Squadron completed in 1843. Another one was The Conqueror towing Africa off the Shoals of Trafalgar which was completed in 1841 by Carmichael. James was so devoted to the art of painting that apart from creature beautiful portraits all through his life, he had also written two books on the same. These two writings by him were The Art of Marine Painting made in Oil colour in 1864 and the watercolour painting called The Art of Marine Painting in 1859. Apart from the temporary exhibitions which were conducted in several parts of the country and sometimes at the global level, he was a consistent exhibitor at a chosen few. These exhibition locations were at Newcastle. The Carlisle Academy beginning from 1828 then the Northern Academy from 1829. In 1835, he again exhibited at the Royal Academy and afterwards at the British Institution regularly from 1846. One more of his regular sites was the Suffolk Gallery since beginning in 1838. After spending a major part of his life in his birthplace, Carmichael moved out of Newcastle in 1845. He chose to move to the city of London which was comparatively easy for him because he was already familiar with the place and known among the citizens of London as a reputed and skilled painter from the marine. 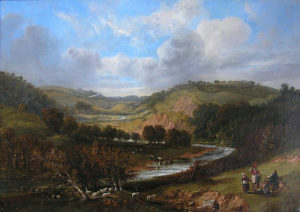 Since James was highly devoted to his profession and was consisting of providing quality works of oil painting, he was beginning to settle as a reputed Northumbria. Additionally, he was counted among the best. His oil and water paintings were mostly landscape and marine based. This gave him a ticket later on to come back to the shores of the sea. His works were so popular there that he was even invited to the Baltic while the Crimean war was on in the year 1855. The purpose for which he received the invitation was to make paintings for the Illustrated London news firm. There were several kinds of observations made by Carmichael during his period at the Baltic during the war which served as his inspiration for the paintings he made. One such exemplary painting was the Bombardment of Syeaborg. This particular capture made using canvas and colours was later a part of the exhibition conducted at the Royal Academy and is preserved till date in the National Maritime Museum. Carmichael moved once again and this time to the city of Brighton in 1840 and painted a few more set of remarkable paintings. 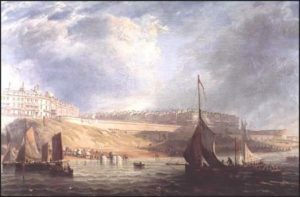 These were The Seafront at Brighton in 1847, Kemptown from the Sea in 1840, The Brighton Viaduct on the Brighton and Lewes and Hastings Railway in 1848. Despite being busy with his career James had a normal married life with constant support for all the ups and downs he faced during his long career of almost 30 years. He got married only once during his lifetime to Lade Mary Sweet in 1826. For the next twenty years of their life, they were intact as a married couple and moved to various locations as per the requirements of Carmichael’s career. They had two children, one boy and a girl. Their daughter, Annie later got married to an artist with similar background like Carmichael’s. The artist was known by the name William Luson Thomas who again the son of a shipbroker and later emerged as a successful artist. The best contribution of William to the art world is considered at the foundation of the Graphic Newspaper by him in the year 1869. He was majorly frustrated with the existing works which appeared in the Illustrated London and then established his own which later has a remarkable impact on the art world. In the 1870s Carmichael decided to rest his paintbrush and enjoy the that was still left with his old age. He moved with his family from London to Scarborough and remained there till his death. The untimely passing away of his son deprived the joy out of him. His lifelong efforts have now been put together at one single place in National Maritime Museum at Newcastle and a few more at Greenwich, Sunderland art galleries and Gateshead as well. Some additional exhibits of his paintings were organized in 1982 at the Laing Art Gallery in Newcastle being associated with Newcastle festival. Later another one was organized in 1999 in Newcastle itself to celebrate 200 years of his birth in town. Other locations of the exhibition were at the British Institution, Society of British Arts and Royal Academy as well from 1835 to 1859, while he was still alive. He died in 1868 at his home in Scarborough.